Each of the AC Hotels by Marriott is designed to reflect the soul of the surrounding community and ultimately provide guests with “the essentials of a beautiful stay” through a blend of quality, comfort, lasting European design and locally driven authenticity. 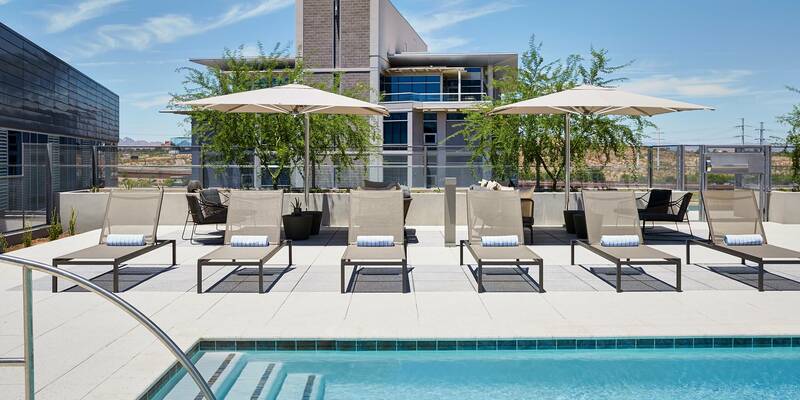 Woodbine’s interpretation of these standards for AC Hotel Tempe proved to be the embodiment of what the brand could be in the United States, and the hotel was lauded and celebrated by both Marriott leadership and the local market. AC Hotel Tempe nestles between Arizona State University’s “A” Mountain and the adjacent Tempe Town Lake, the sources of the property’s “earth and water” theme. Our team collaborated with a mix of partners to bring that theme to life in obvious and understated ways—from patterns in wall coverings, flooring and tilework to structural elements, color schemes and art displayed throughout. The collection of paintings, sculptures and mixed-media not only supports the water-and-earth theme but also underscores a local passion and support for the arts. In total, AC Hotel Tempe features more than 170 pieces of custom artwork, which adorn the lobby, lounge, kitchen, hallways and each of the 155 guestrooms.